We all know about the huge mega-ships from Royal Caribbean with the newest being Spectrum of the Seas which is just about the join the fleet but how about an aircraft? The cruise line announced Master of the Skies, a new aircraft which will take to the skies in 2022. The aircraft will provide amazing cruise like vacations at 35,000 feet in the air. 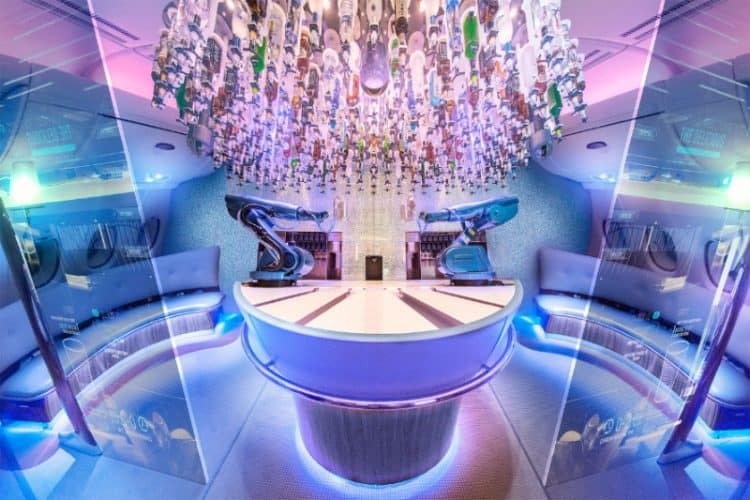 Passengers will get to enjoy some popular and innovative features already found on some cruise ships such as the Ultimate Abyss slide, the Ultimate Family Suite, Binoc bar, and sky diving Ripcord by iFLY. They will all be included in an aircraft vacation like no other in the world! The Ultimate Family Suite for VIP will be the perfect place to relax and have some fun. The exclusive space will feature the first ever “Slide in the Sky” named Marvel. The slide will twist around the double-decker cabin. The inspiration has been taken from the Ultimate Family Suit which is featured on Symphony of the Seas, the world’s largest cruise ship. We’ve all heard or seen bars on airlane before but not a Bionic Bar. This bar will feature robotic bartenders just like on the Quantum-class ships from Royal Caribbean. They will shake and stir customized cocktails which passengers are going to enjoy trying. Master of the Skies will also be featuring sky diving with Ripcord by IFLY. This experience will be similar to what is already being offered on the Quantum-class cruise ships, but this one will offer a mile-high skydive like no other large passenger aircraft! Also Read: Why Not Take A Cruise On The Carnival Submarine! The plane will be the perfect choice for those heading towards a Royal Caribbean cruise. Unfortunately this likely won’t be happening as it’s April Fools Day! We can still dream that one day this could become a reality. Well done to Royal Caribbean UK coming up with this creative idea.